Found this female-type Northern Shoveler with Mallards under the guard rail at the Turner's Falls power canal this morning. Not at all common locally, at least in my experience. 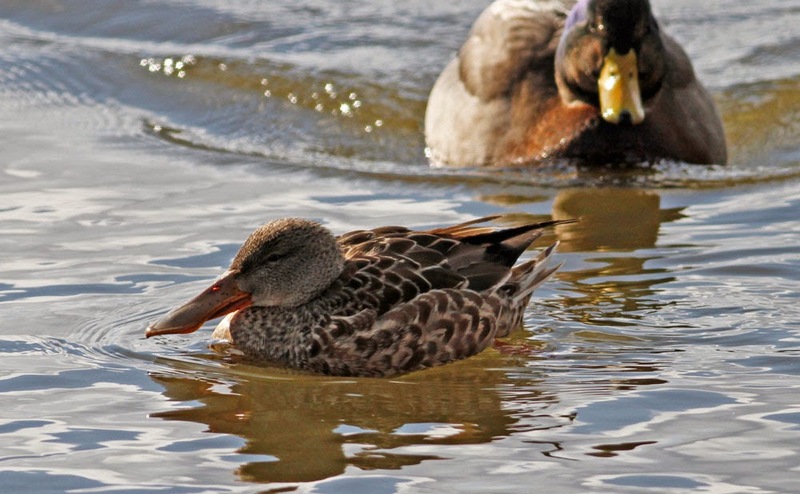 I usually seem them in late fall and early spring and, like this one, nearly always singles. 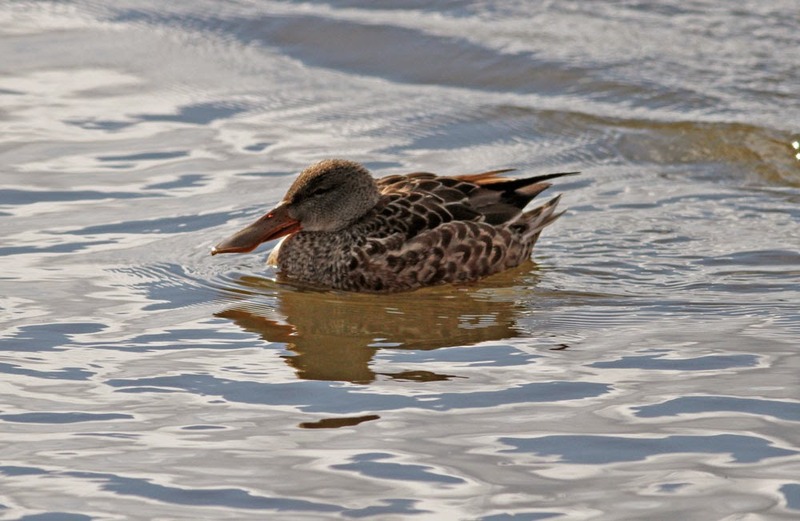 Northern Shoveler - female, Turner's Falls power canal, Franklin Co., MA. December 31st, 2014. Ross's Goose - Turner's Falls power canal, Franklin Co., MA. December 25th, 2014. Images taken at first light in mist and rain. Continuing bird now entering count week for the Greenfield CBC. Acting on a suspicion that our local Canada Geese would be spending most of the day out in the fields feeding on corn stubble, I decided to try the Turner's Falls power canal before I did anything else this morning. 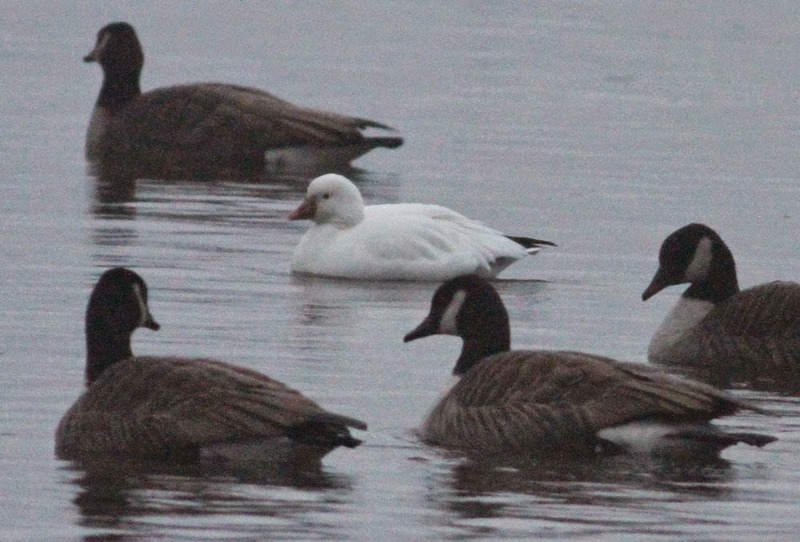 Initially it looked quite gloomy with just a small group of Canadas near the main entrance and nothing white among them. But farther down the canal, quite close to the entrance to the USGS Fish Lab, a nice raft of 350 Canada Geese. 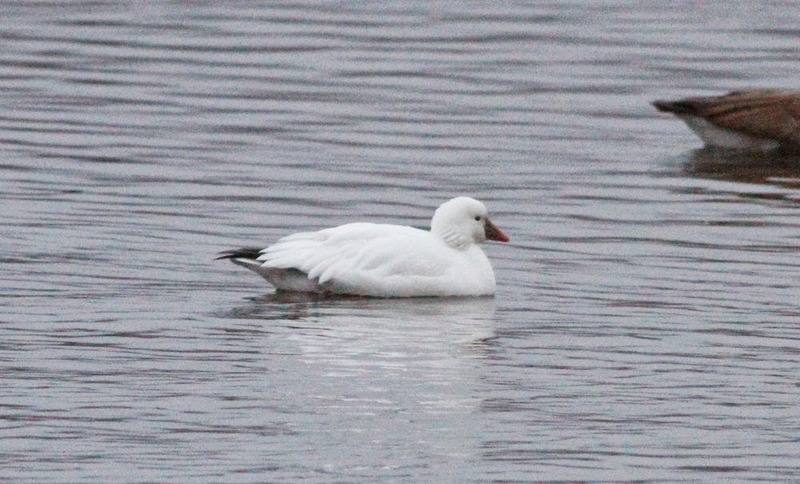 With them several white birds which included 2-3 male Common Goldeneye and the Ross's Goose. 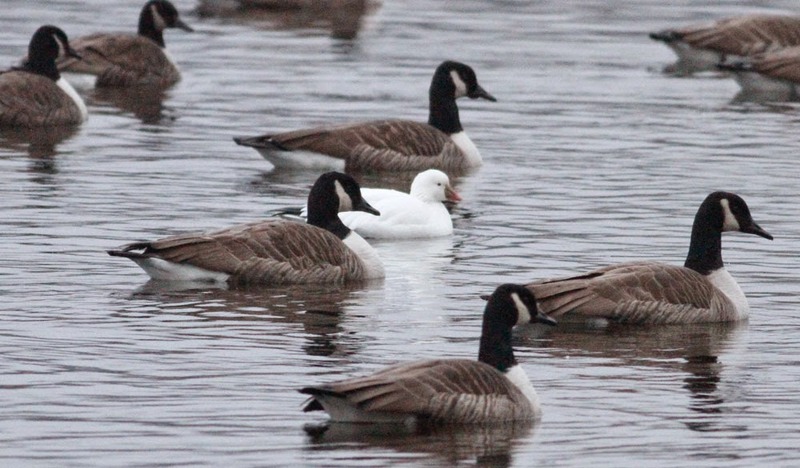 The tiny white goose stood out like a sore thumb among its big brown cousins. 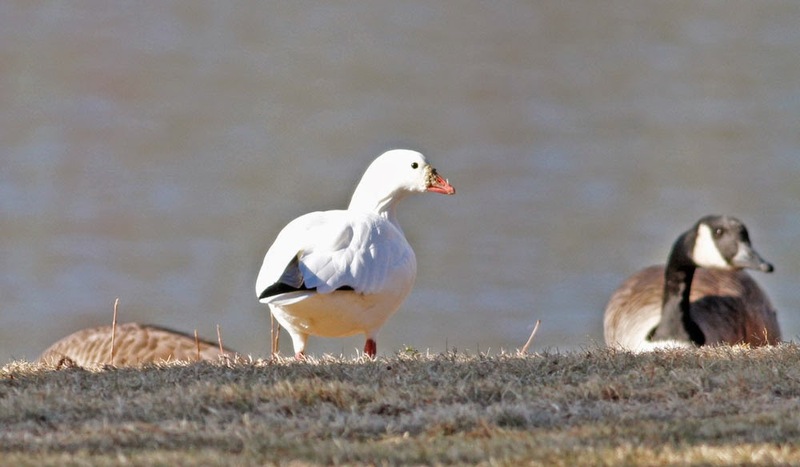 So having been missing since Sunday, the Ross's Goose continues and I'm not over surprised by this. Most unusual geese at this site tend to stage for 5-10 days or more before moving on. At the moment conditions are ideal (mild and wet) for feeding so unless hunting activity pushes them back to the canal or to Barton Cove, the geese will most likely be absent for large chunks of the day as we've just experienced in the early part of this week. The best bet for catching up with the Ross's would be very early morning (before 07:30hrs) or late afternoon/early evening. Ross's Goose - Turner's Falls power canal, Franklin Co., MA. December 24th, 2014. 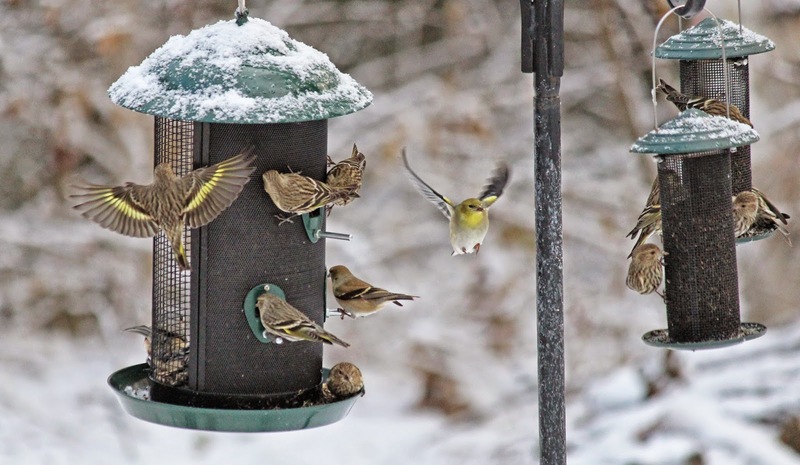 Images taken at first light in heavy overcast and drizzle. Continuing bird, first found by Bob Zadja on December 20th. I'm certain it's the same individual which now appears to be attempting to overwinter and could be a really nice bird to work for on Sunday's Christmas bird count. Eastern Phoebe - Turner's Falls power canal, Franklin Co., MA. December 23rd, 2014. 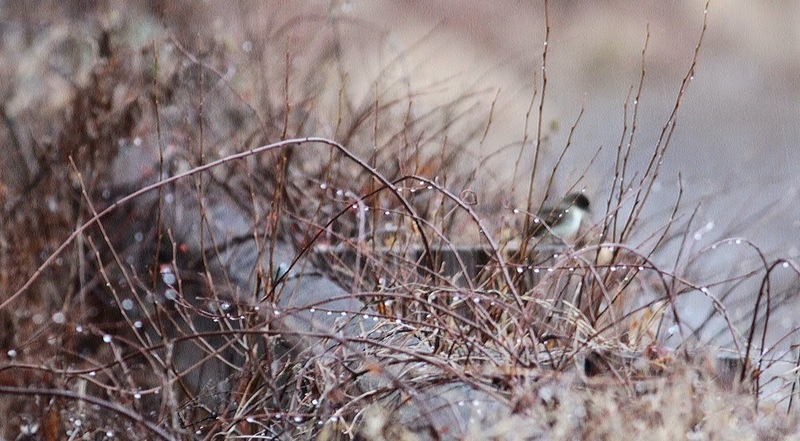 The camera refused to focus on the bird in the gloom with the few seconds I had before it moved along the guard rail. Kumlien's Iceland Gull (right) - adult, Barton Cove, Gill, Franklin Co., MA. December 23rd, 2014. Common Mergansers - Barton Cove, Gill, Franklin Co., MA. December 23rd, 2014. 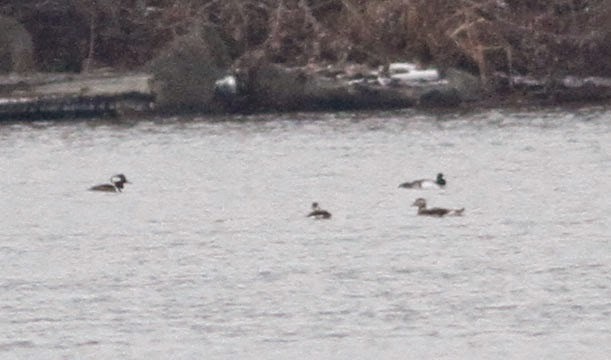 In addition to the phoebe, two Buffleheads and a Hermit Thrush were the main interest at the power canal, while up at Barton Cove two Canvasbacks and two Ring-necked Ducks continue along with impressive gatherings of Common and Hooded Mergansers. 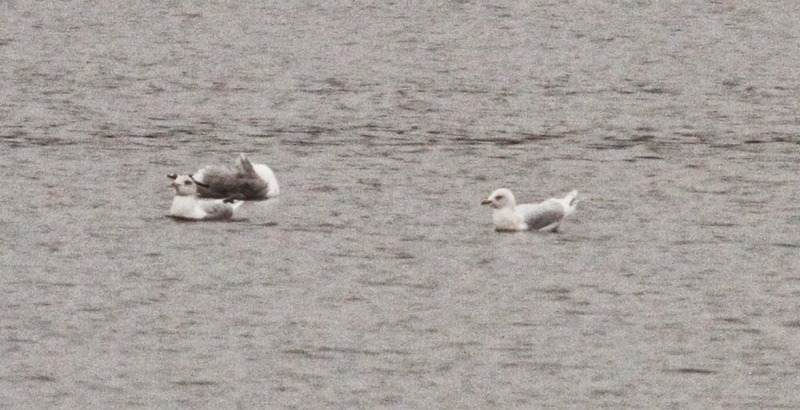 Also this evening, two fine adult Kumlien's Iceland Gulls were bathing off Riverview Drive at Barton Cove. Despite the rain, the day was actually full of interesting birds beginning just after dawn with nice naked-eye views of Barred Owl and Yellow-bellied Sapsucker this morning on North Cross Road in Gill. 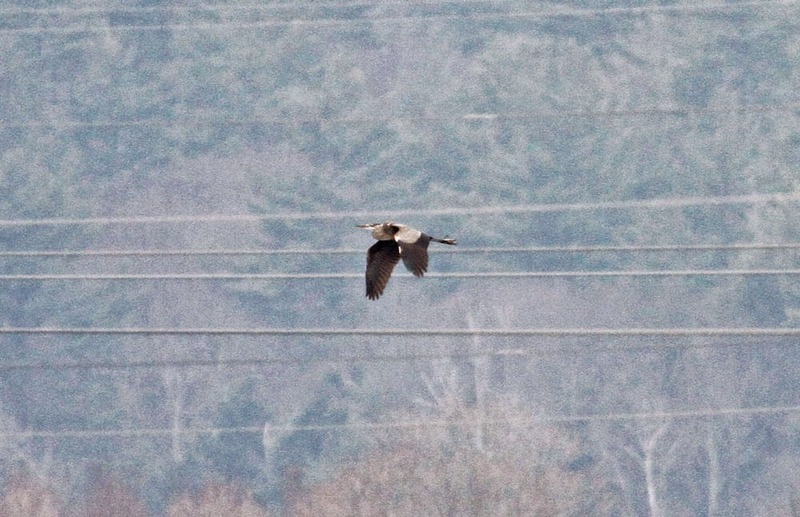 Both the power canal and Barton Cove have been strangely bereft of geese since the weekend and there hasn't been a sighting of the Ross's Goose since a brief observation on Sunday morning. Still, my guess would be that it's still in the area and will eventually be found again this week. This morning I happened to be passing the Hinsdale Setbacks on the Connecticut River. It's been a while since I've done any birding at all in New Hampshire and this spot is a mere fifteen minutes from our new house in Northfield. I dare say I'll be doing a bit more here over the next few months. Several years ago we lived in Keene, NH and spent plenty of time birding and hiking in this particular corner of the state. Needless to say, it was really good to get back and do a little birding if only for a few minutes. My expectations were not high but I was pleasantly surprised by the range and numbers of species visible above Vernon Dam. Hooded Mergansers were by far the most common duck with over 100 present. Less expected were 2 Red-necked Grebes, 2 Long-tailed Ducks, a Common Loon, a Mute Swan and a Great Blue Heron. All of the water on the river was ice-free but I expect most of these species will disperse once the really hard weather arrives and the river freezes up. Still I was pleased with this haul and will try and get back again soon. 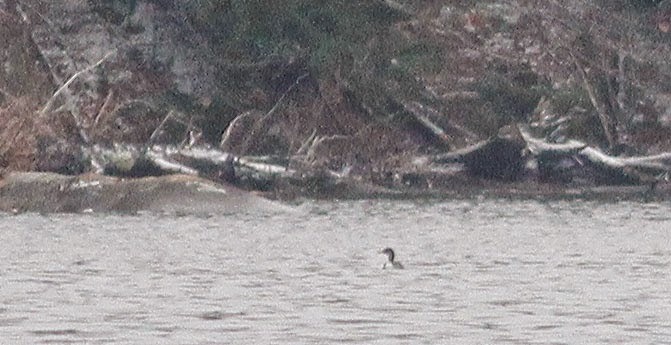 Common Loon - Hinsdale Setbacks, Cheshire Co., NH. December 22nd, 2014. Long-tailed Ducks (2) - with Hooded Mergansers, Hinsdale Setbacks, Cheshire Co., NH. December 22nd, 2014. 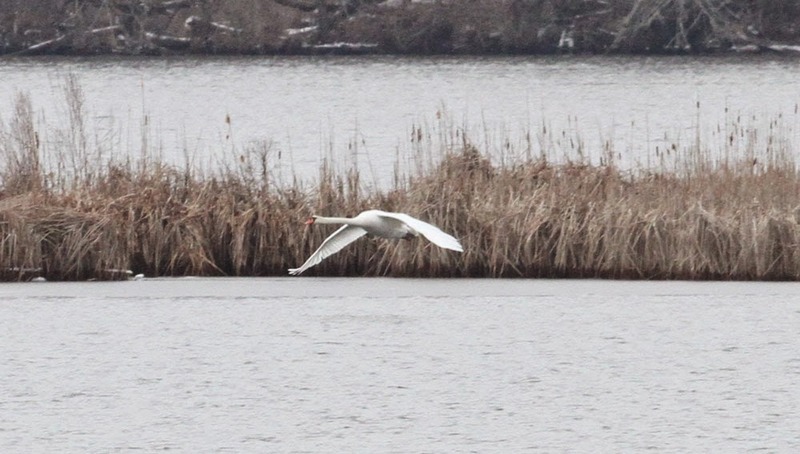 Mute Swan - Hinsdale Setbacks, Cheshire Co., NH. December 22nd, 2014. Great Blue Heron - Hinsdale Setbacks, Cheshire Co., NH. December 22nd, 2014. 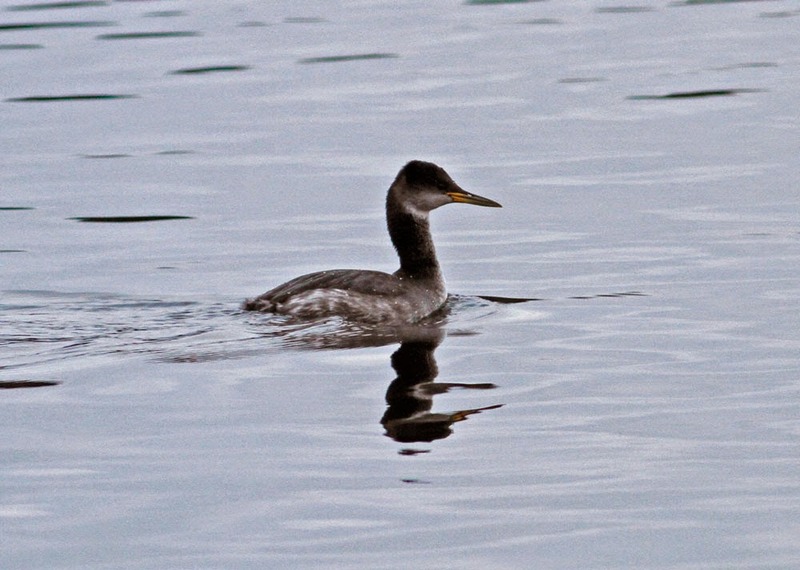 Red-necked Grebe (one of two) - Hinsdale Setbacks, Cheshire Co., NH. December 22nd, 2014. So, the 'purple patch' in the Pioneer Valley continues. I'd just finished a four-mile run in Gill and was about to drive home when I thought I'd better check the Western Mass Birders Facebook page...and I'm glad I did! 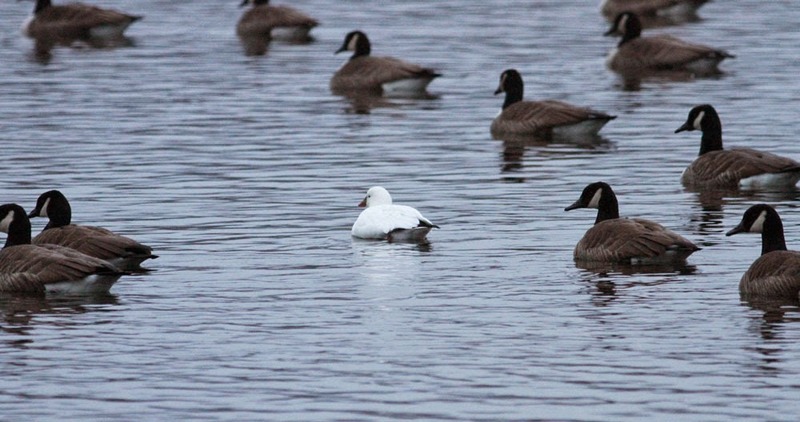 Steve Moytl had just posted rather briefly "Second hand report from Bob Zadja of adult Ross's Goose at Bartons Cove". I was just five minutes away and, despite not having my camera with me, could hardly resist a quick look. 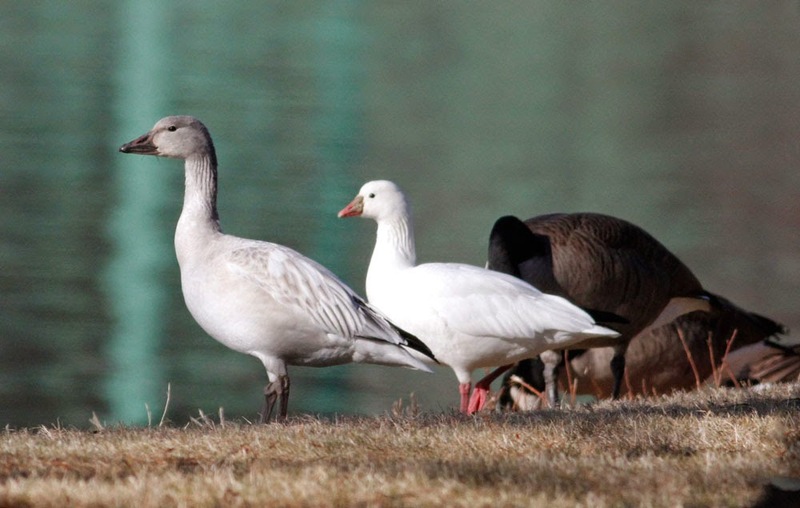 Scanning from Riverview Drive in Gill I soon picked up two white geese among hordes of Canadas, one them clearly being the described adult Ross's Goose. The whole flock slowly drifted across from Turner's Falls and started linger on the Gill side of the river at which point I put out an additional alert on WMB and then headed home for my camera. In between times Scott Surner had also received a call from Bob Zadja, and called me just to make sure that I was in the loop. 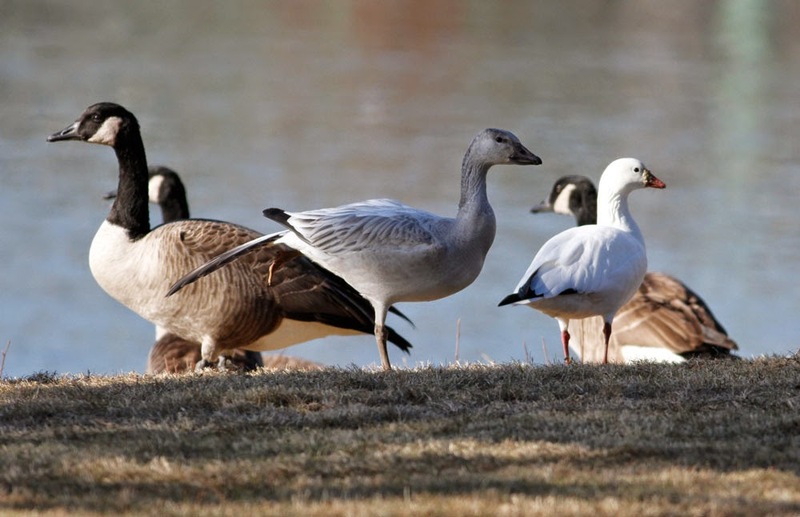 About an hour later, Scott and I were enjoying the Ross's Goose together as it grazed with Canada Geese and two Snow Geese off Riverview Drive. Apparently, according to WMB, it spent much of the day in the same spot allowing many local birders to catch up with it. Kudos to the finder Bob Zadja, and to Steve Moytl for getting the word out so quickly on WMB. 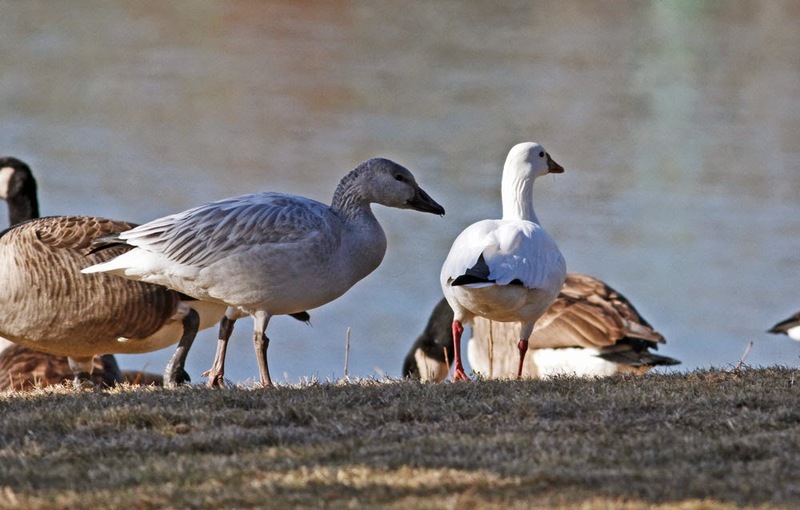 Ross's Goose - with immature Snow Goose (two present), Gill, Franklin Co., MA. December 20th, 2014. This morning I couldn't resist have another look at the goldeneye flock on the Connecticut River at Bennet Meadow. It was quite the spectacle, even more birds than yesterday with about 130 goldeneye in all. The birds seemed nervous this morning, roaming up and down the river, apparently very wary of an adult Bald Eagle patrolling the area. 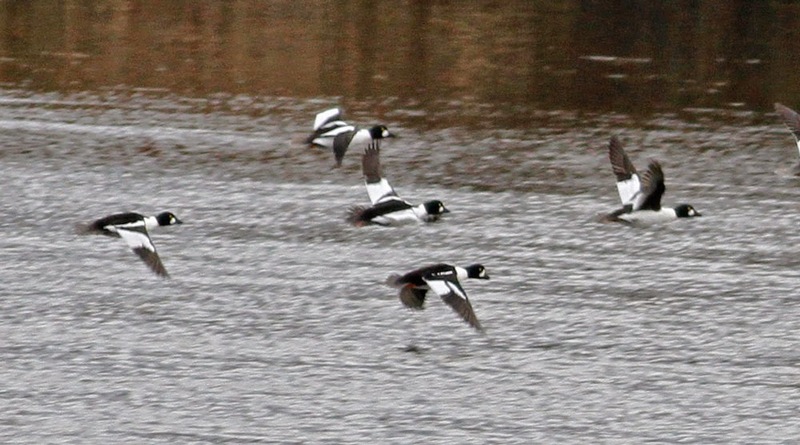 The male Barrow's Goldeneye was still present offering some nice 'in flight' comparisons with Common Goldeneye. 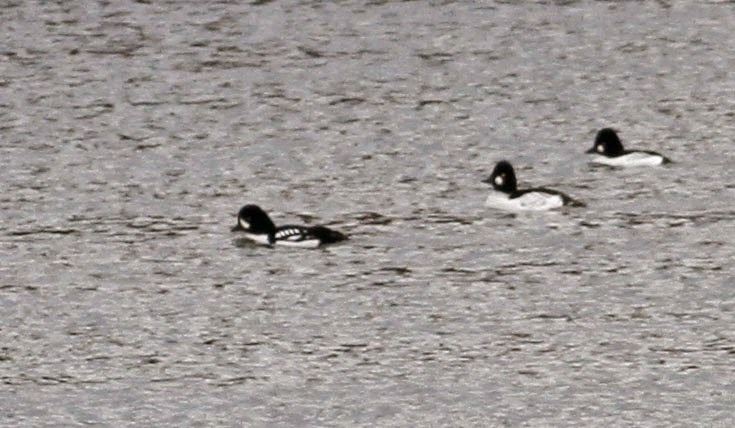 Barrow's Goldeneye (center in all three images) - male with male Common Goldeneyes, Bennet Meadow, Northfield, Franklin Co., MA. December 19th, 2014. MA - another drake Barrow's? This morning I quickly checked the Turner's Falls power canal hopeful of seeing Eric Huston's Horned Grebe that he found there yesterday. 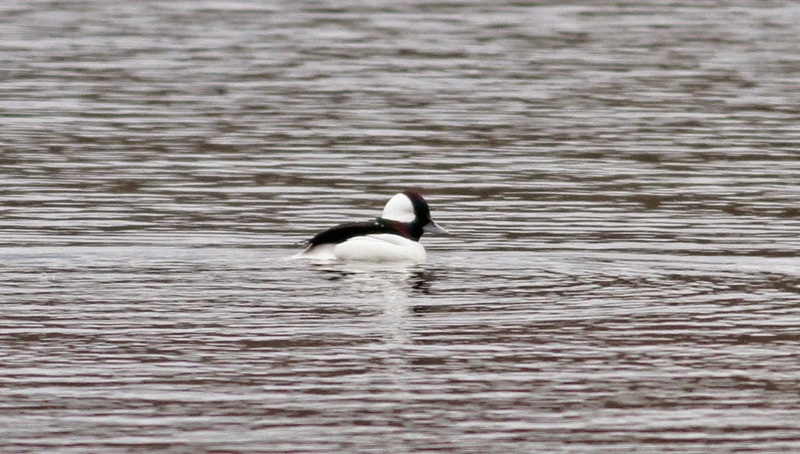 No dice on the grebe but a pair of Bufflehead were nice, along with a handful of Common Goldeneye and Common Mergansers. 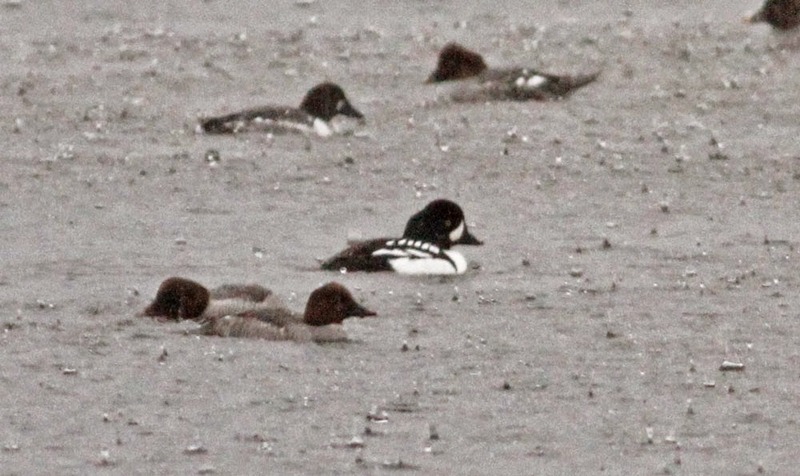 Late last week Josh Rose reported close to 100 Common Goldeneye at Bennet Meadow, a mere half mile from our house in Northfield. 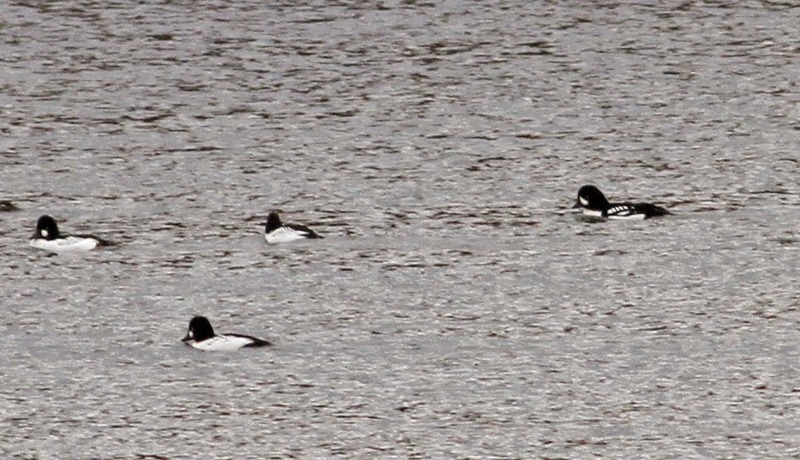 It sounded like an impressive gathering and was also a spot where I'd seen a Barrow's Goldeneye (females) in the past. I arrived at about 09:20 hours and wasn't disappointed. About quarter of a mile downstream, a superb raft of over 100 Common Goldeneye as well as a single Common Merganser and a loitering Herring Gull. After a few minutes of searching - 'boom! ', there was a fine male Barrow's Goldeneye. Straight away, I wrestled with the idea that it was the same male frequenting the river at Turner's Falls and Montague, but to me this individual looked different, 'blacker' somehow with an apparently thicker black spur and slightly fewer white spots on the upperparts. As it happened, Josh Rose was out and about this morning as well and reported negative news on the male Barrow's from both the power canal and the rail trail bridge at Montague City. Franklin Co., MA. December 18th, 2014. 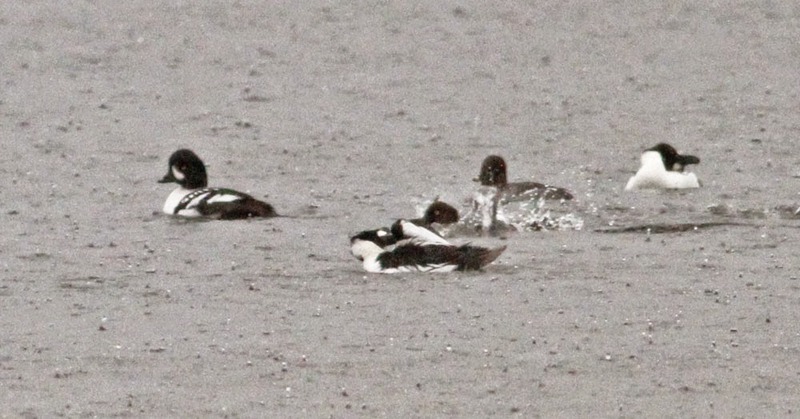 So could the same male Barrow's Goldeneye be commuting between Northfield and Turner's Falls? That's a distance of roughly nine miles by car and probably much further on the river given the river bends and meanders. Moreover, aside from Barton Cove and the Rod and Gun club, large sections of the Connecticut River between Turner's Falls and Northfield are simply not checked. It seems like a stretch that we should be finding the same single drake Barrow's at the few spots where we can access on the river. Anyhow, time should reveal more and, to be honest, I'm just delighted that these handsome diving ducks are becoming a feature of our winter here in the valley. Also of note today, a Common Redpoll flying over Gill Elementery School on Boyle Road at 06:55hrs, and 2 (first-cycle) Kumlien's Iceland Gulls and a Lesser Black-backed Gull at Barton Cove in the evening. Bufflehead - male, Turner's Falls power canal, Franklin Co., MA. December 18th, 2014. Numbers of gulls continue to build at Barton Cove/Turner's Falls and yesterday evening (12/16) I noted about 700, mostly large gulls, moving around between Barton Cove and the open water just above the Turner's Falls dam. For the most part the birds were distant but I did manage to pick out an adult Lesser Black-backed Gull and two Kumlien's Iceland Gulls, both of them new for this month and one of them a fine adult, my first of the winter. 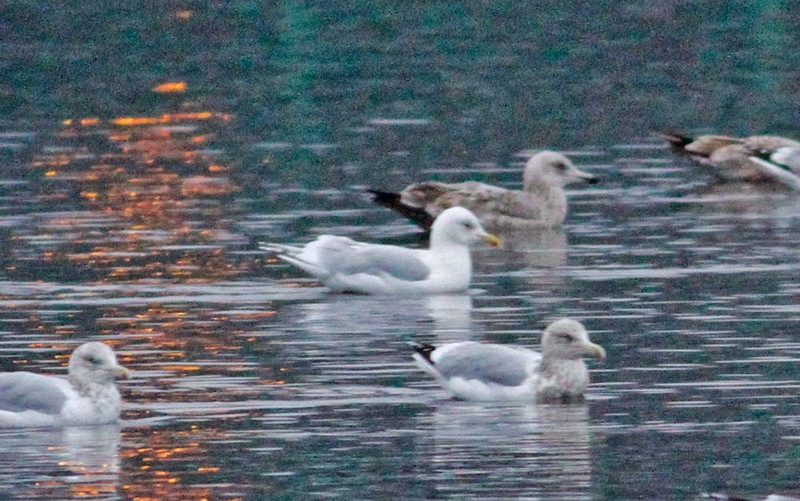 Kumlien's Iceland Gull (center) - adult at dusk, Unity Park, Turner's Falls, Franklin Co., MA. December 16th, 2014. Nice looking bird and my first adult of the winter. 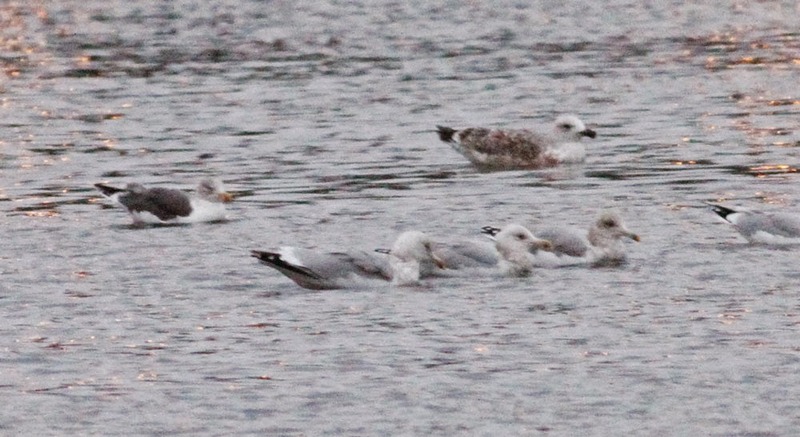 Lesser Black-backed Gull (upper left) - adult , Unity Park, Turner's Falls, Franklin Co., MA. December 15th, 2014. One drake Canvasback remained at Barton Cove, though I noted from an ebird reports that three were still present on the 13th. Down at the power canal, the waterfowl roost was very busy though extremely poor light made accurate counting difficult. 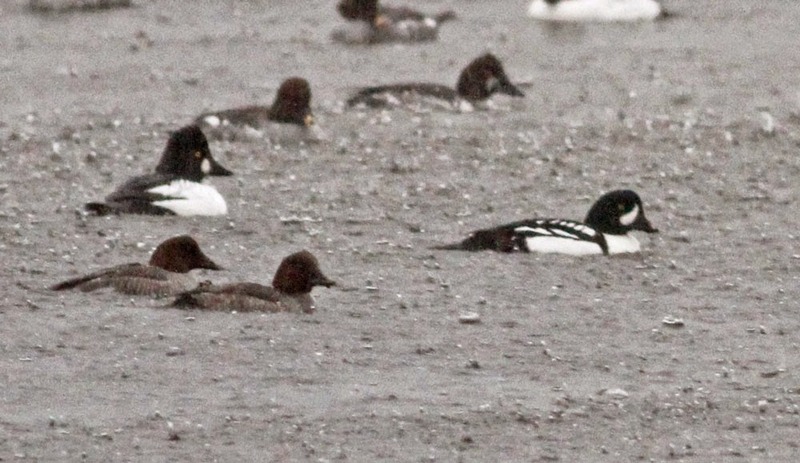 Thankfully, the continuing drake Barrow's Goldeneye came in early and well ahead of the bulk of 100+ Common Goldeneye that eventually came into roost. 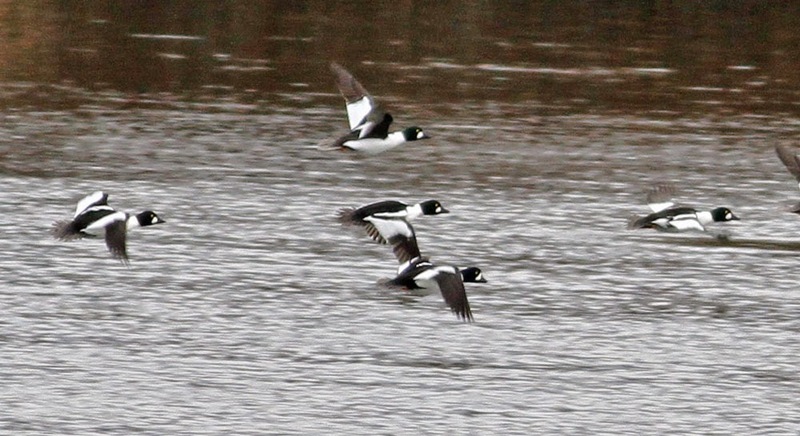 With them, a nice pair of Bufflehead. 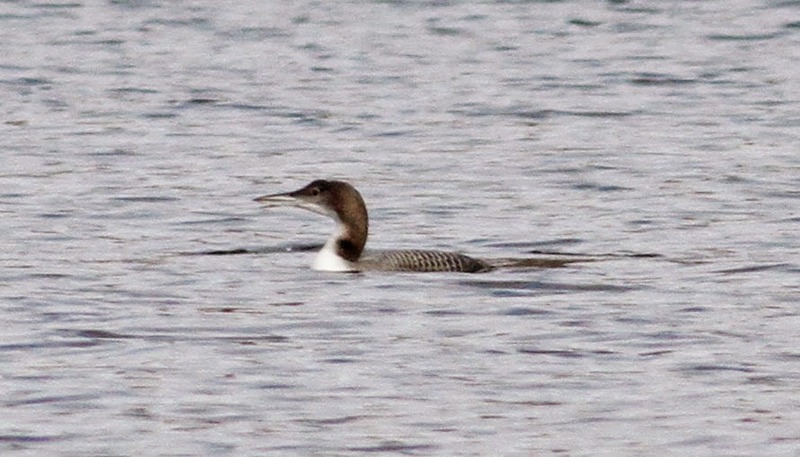 Perhaps most surprising, a lingering Common Loon at the Turner's Falls Rod and Gun club, not especially expected on the CT River in December - will it/can it stick around for the Christmas bird count on December 28th? Common Loon - juvenile, Turner's Falls, Franklin Co., MA. December 15th, 2014. 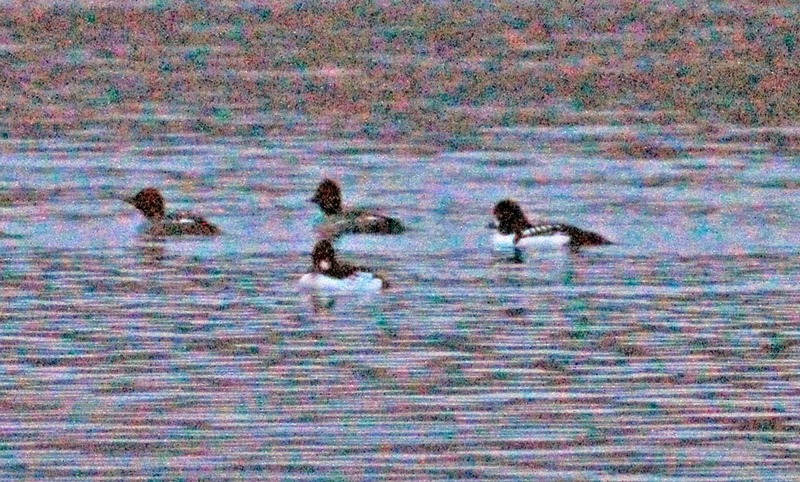 Barrow's Goldeneye (right) - male at dusk, Turner's Falls power canal, Franklin Co., MA. December 16th, 2014. 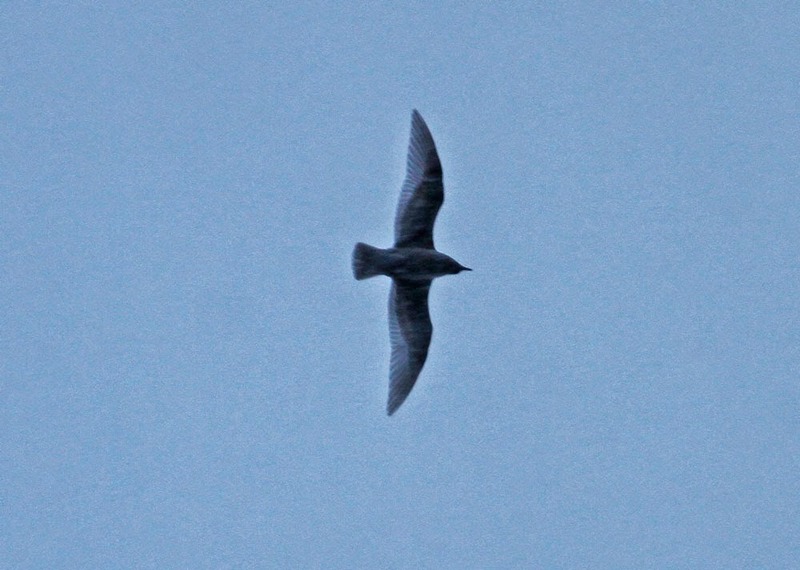 Horrible grainy record shot taken well after dusk. This was male was displaying to female Common Goldeneyes. 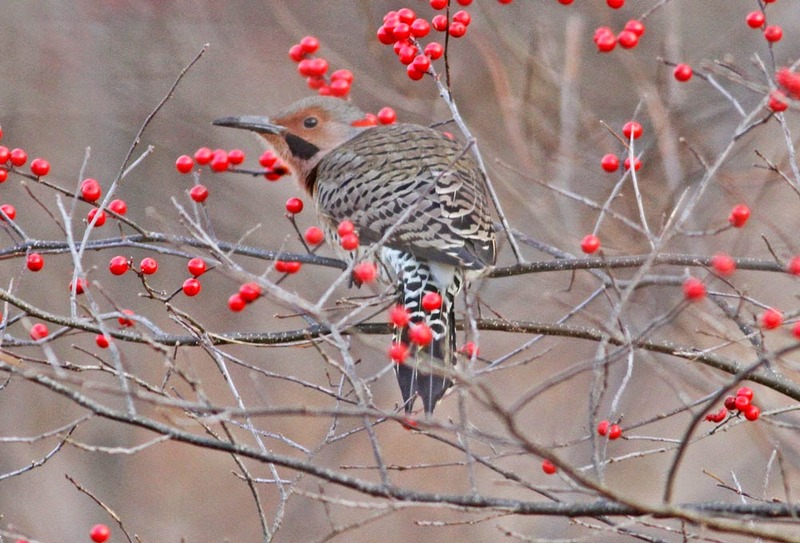 Northern Flicker - Barton Cove, Gill, Franklin Co., MA. December 15th, 2014. So many flickers around at the moment. This morning (12/17) I had a cruise around Hadley in between errands. The Long-eared Owl that gave such fine views on Sunday was present at its roost, though I wasn't over surprised to see that it had moved on. There was a nice juvenile Northern Harrier quartering the area, a bird which we didn't see on Sunday's count but otherwise the Honey Pot seemed exceedingly quiet. By contrast huge numbers of birds were feeding in the damp fields SW of Meadow Street and Russelville Roads - well over 1000 Canada Geese, 200 Ring-billed Gulls, 150 Horned Larks among other things. There was also a Yellow-bellied Sapsucker in the large yard right at the intersection of Russelville Road and Meadow Street. On Sunday morning I joined Scott Surner for our annual 'bash' around Hadley for Scott's sector of the Northampton Christmas Bird Count. We were fortunate to have perfect weather throughout the day. We were even more fortunate to be joined by Brian Kane and the three of us met at 7am for a dawn to dusk effort along the eastern side of the Connecticut River. Key sites included Hadley Cove, Food Bank Farm, Aqua Vitae Road, Hadley Honey Pot and the end of Meadow Street in North Hadley. We finished with about 53 species for the day, more than respectable for a field day in mid-December in the Pioneer Valley. 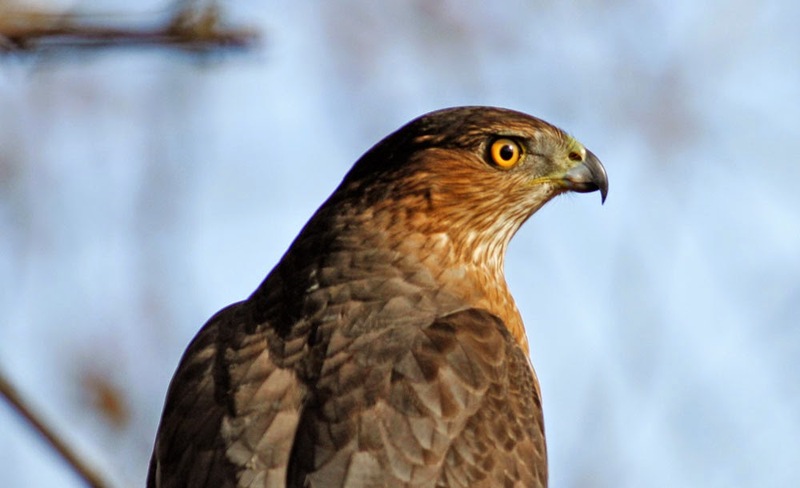 Highlights included the finding of a roosting Long-eared Owl, and close up observations of adult Peregrine and adult Cooper's Hawk. Good finds for our particular count area included a Hermit Thrush, a Yellow-bellied Sapsucker and whopping count of 24 Northern Pintail for the day. Gracious thanks go Scott and Brian for sharing their field skills and good humor throughout the day. Scott did especially well since he started his day well before first light with a moderately successful owl-prowl in Amherst that included two Northern Saw-whets - not too shabby. How nice for him to have exquisite views of a Long-eared Owl to go with his spotlighted saw-whets! 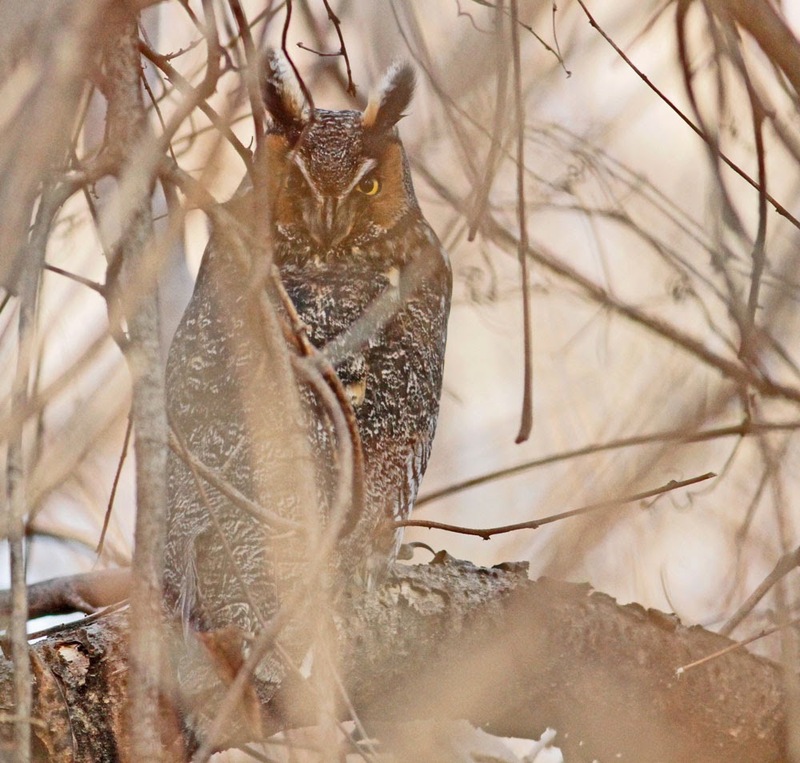 Long-eared Owl - Hadley, Hampshire Co., MA. December 14th, 2014. Found in a dense tangle of shrubs alongside the Connecticut River and left undisturbed at its roost. Certainly the highlight of the day from our sector of the Northampton CBC that consistently produces good birds. 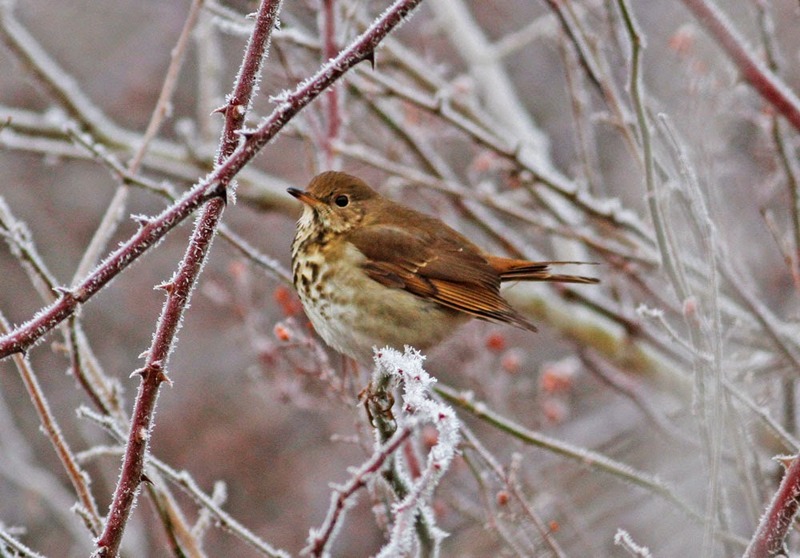 Hermit Thrush - Food Bank Farm, Hadley, Hampshire Co., MA. December 14th, 2014.
Cooper's Hawk - male, Hadley, Hampshire Co., MA. December 14th, 2014. 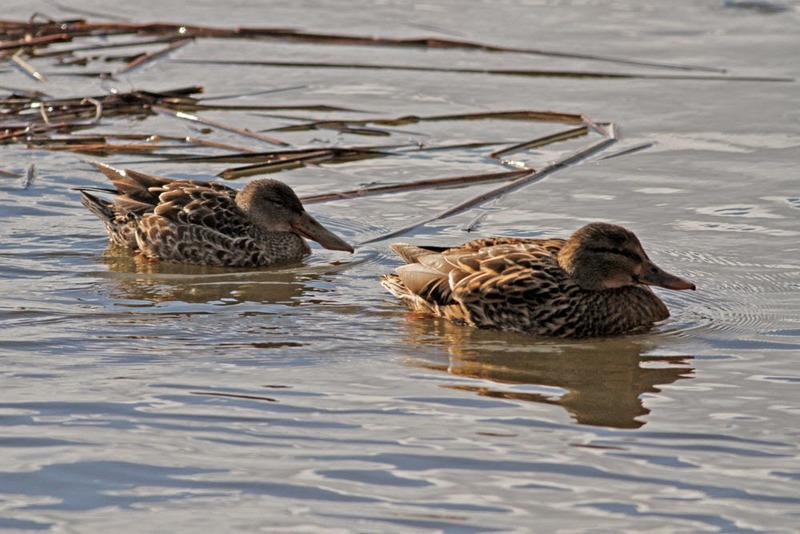 Northern Pintails (and Black Duck) - North Hadley, Hampshire Co., MA. December 14th, 2014. 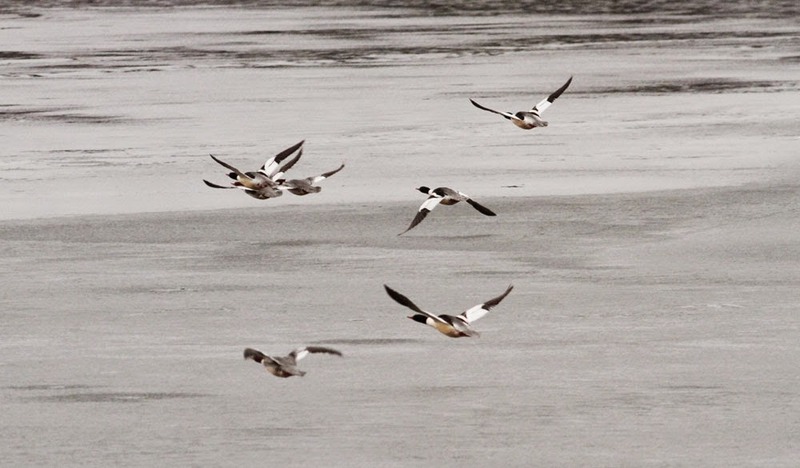 Part of an unprecedented flock of 20 on the Connecticut River at North Hadley. 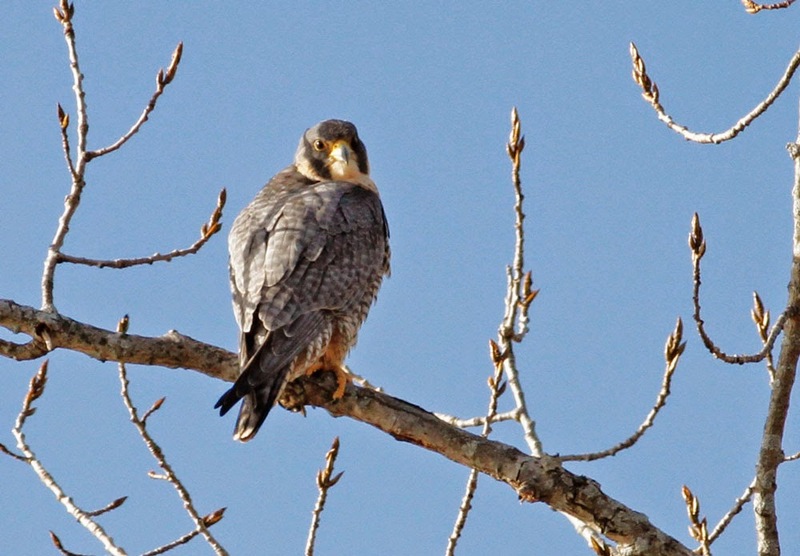 Peregrine - adult, Hadley, Hampshire Co., MA. December 14th, 2014. 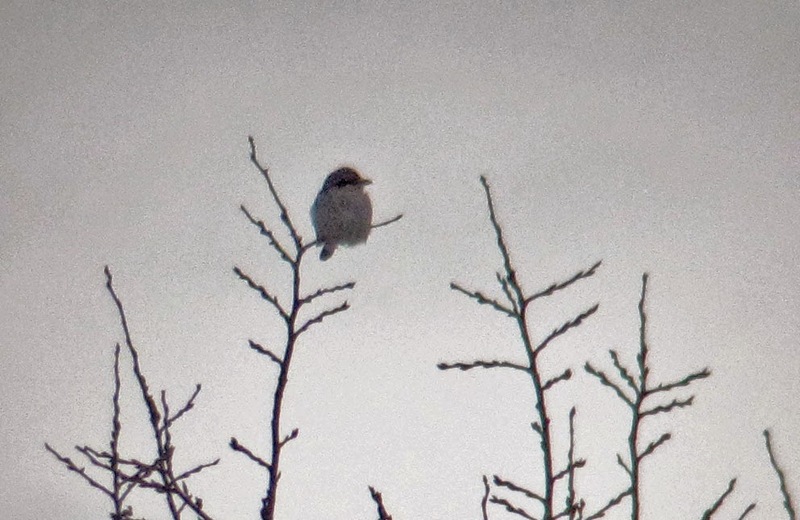 Good to see the Northern Shrike back on sentinel duty on Boyle Road in Gill. It's been almost a week since I last saw it despite driving past twice or more each day to drop Matan at school. This morning it was teed up in the highest saplings at first light. I didn't have my big camera and lens with me but snapped a record shot with my old Canon Powershot G10 and 8 x 42 binoculars. Northern Shrike - Boyle Road, Gill, Franklin Co., MA. December 13th, 2014. The 'purple patch' at Turner's Falls continues with this fine Red-necked Grebe on the power canal, originally found and posted by Bill Lafley this morning. Not only a beautiful bird, but also bizarre in the sense that it was very vocal giving the same call-type recorded as "song" on the Sibley Guides iphone app. Fortunately, Matan and I visited in late afternoon so we didn't have to deal with hordes of Canada Geese which had left the canal to feed, and the grebe was close and vocal. Red-necked Grebe - Turner's Falls power canal, Franklin Co., MA. December 12th, 2014. Up at Unity Park, gull diversity is picking up with increased numbers of Great Black-backed Gulls, especially adults. Yesterday, a lone Kumlien's Iceland Gull was loafing around and this evening an Lesser Black-backed Gull showed up very late in the day. The gulls seem very unsettled at the moment and are frequently flushed by the local Bald Eagles. Kumlien's Iceland Gull - Unity Park, Turner's Falls, Franklin Co., MA. December 11th, 2014. One of hundreds of high flying gulls that never settled due to Bald Eagle activity. 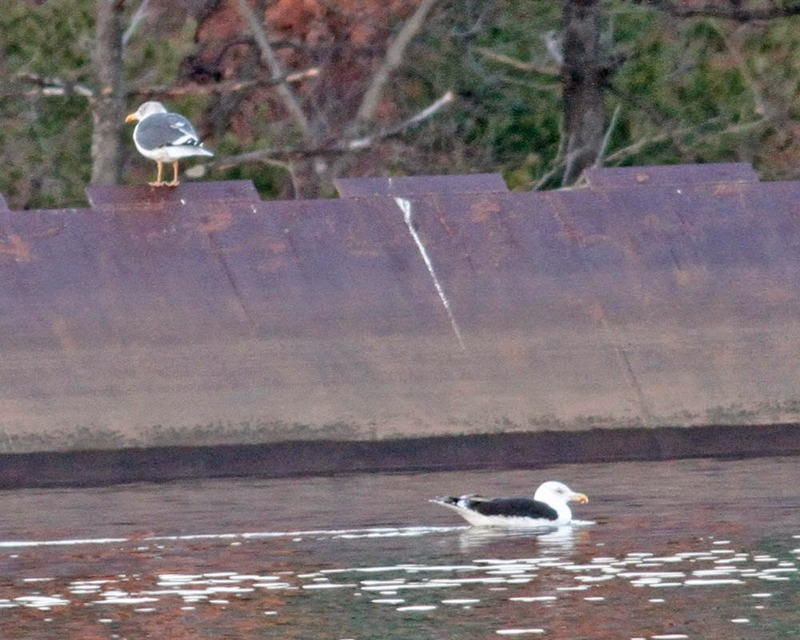 Lesser Black-backed Gull (left) - adult, Unity Park, Turner's Falls, Franklin Co., MA. December 12th, 2014. Hermit Thrush - Greenfield Road, Montague, Franklin Co., MA. December 11th, 2014. After a couple of Pine Siskins on the feeders at home yesterday, this morning saw a much bigger arrival with at least 150 moving SW over North Cross Road in Gill just before sunrise. These birds moved across the landscape in a broad, deep wave rather than a bunched flock or a line. 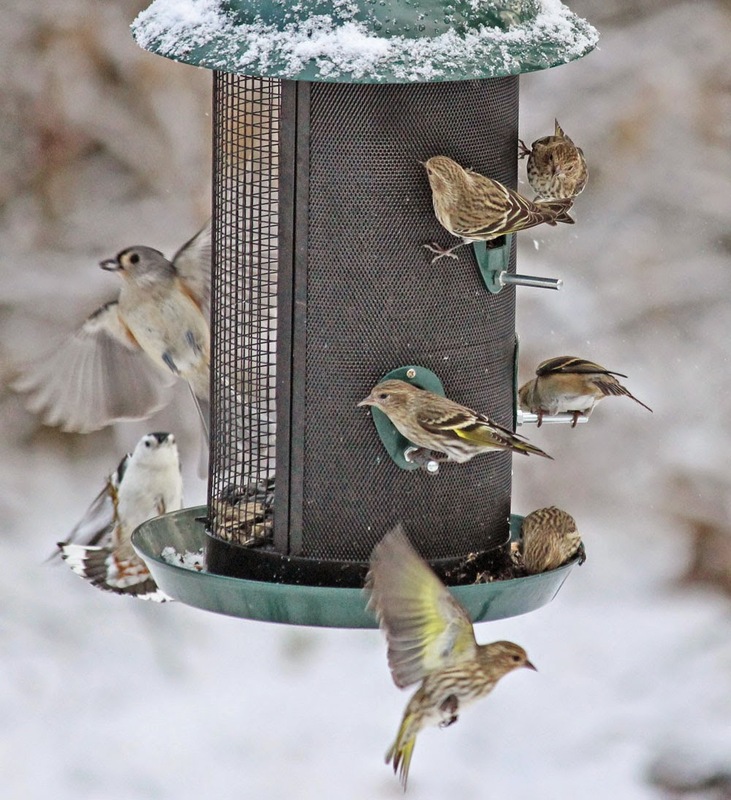 I returned home in Northfield to find 15-20 Pine Siskins wrestling with goldfinches and titmice on our feeders. They looked settled and stayed until mid-morning but I didn't see them at all in the afternoon. After a great fall for this species in Franklin County, my impression was that many/most Pine Siskins had moved through our area but I think the next few days could provide some nice action in local yards with flocks visiting feeders. Hopefully, one or two redpolls will be found with them. 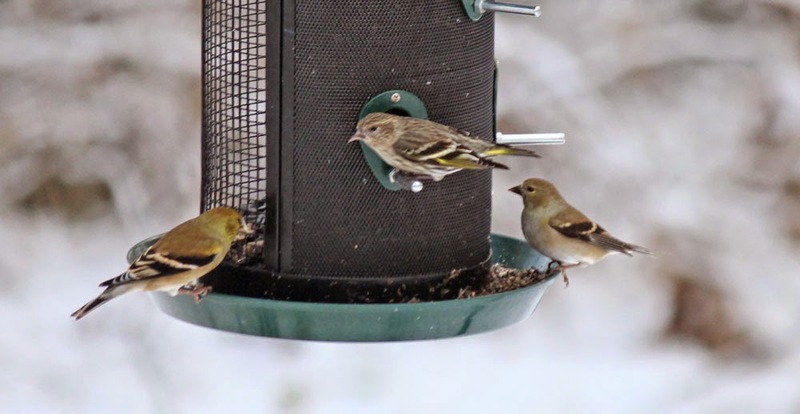 Pine Siskin - flanked by American Goldfinches, Northfield, Franklin Co., MA. December 12th, 2014. It's been almost a week since I last saw the Canvasbacks on Barton Cove. I think I saw the male yesterday in the downpour but I just couldn't be sure in the poor conditions. This morning, whilst searching for post-storm birds, I came across them again tucked under banking close to the public ramp off Rt 2. The group is now down to three and I suspect that one of our local immature Bald Eagles has developed a taste for Canvasback! The group had already been reduced to four when I saw an eagle in an active (but unsuccessful) chase on the Canvasbacks on December 4th. Two days ago I watched a young Bald Eagle eating an unidentified duck on a tire in the middle of the cove. 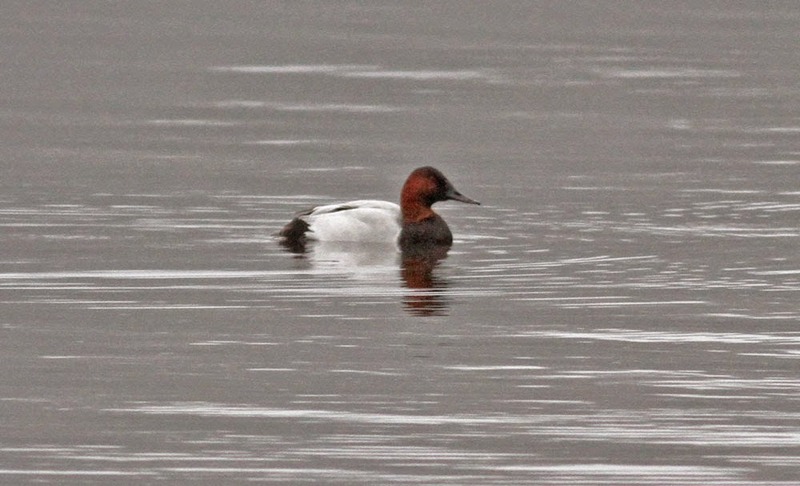 So now it seems that we have just three Canvasbacks from the original five that first arrived on Nov 26th. 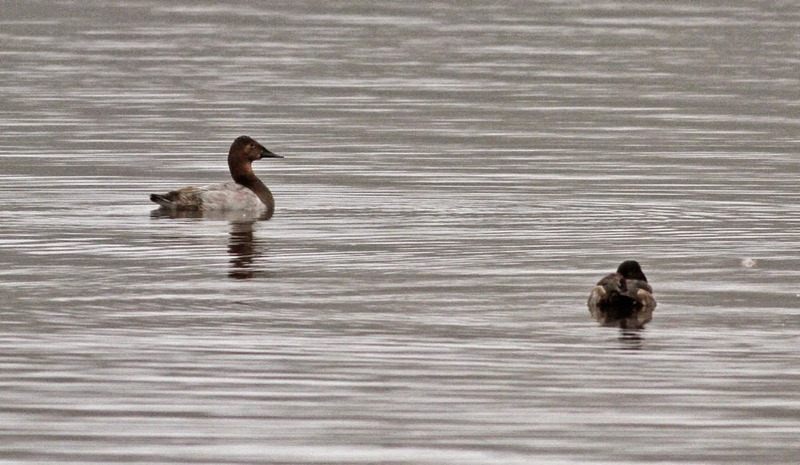 Canvasbacks - with Ring-necked Duck, Barton Cove, Gill, Franklin Co., MA. December 10th, 2014. Also at Barton Cove this morning, continuing rafts of Common and Hooded Mergansers with the former up to 60 birds strong. Passerines included Winter Wren, two Golden-crowned Kinglets and a small flock of Pine Siskins along the campground road. After yesterday's Goldeneye extravaganza, the power canal was almost devoid of birds with just a handful of Common Mergansers and Common Goldeneye present - timing is everything at the power canal. 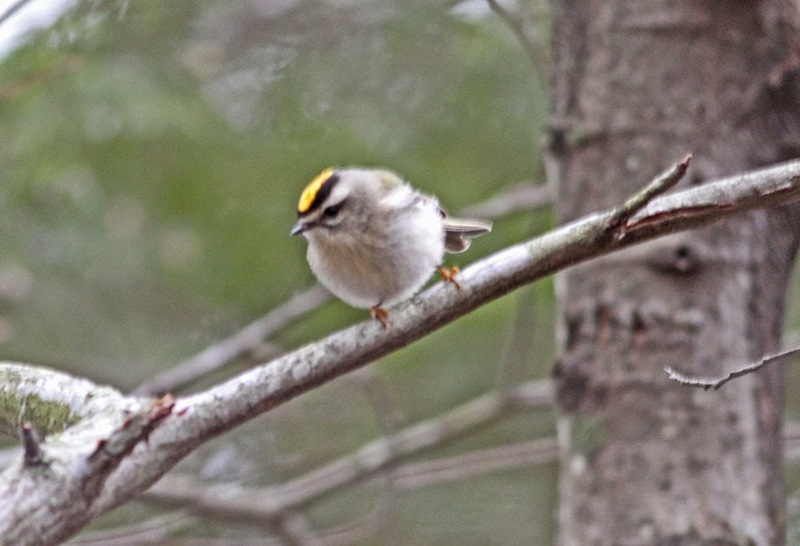 Golden-crowned Kinglet - Barton Cove, Gill, Franklin Co., MA. December 10th, 2014. Another winter storm, this time a really wet one with near torrential rain in the afternoon. In fact, the rain was so heavy it was pointless getting out of the car. 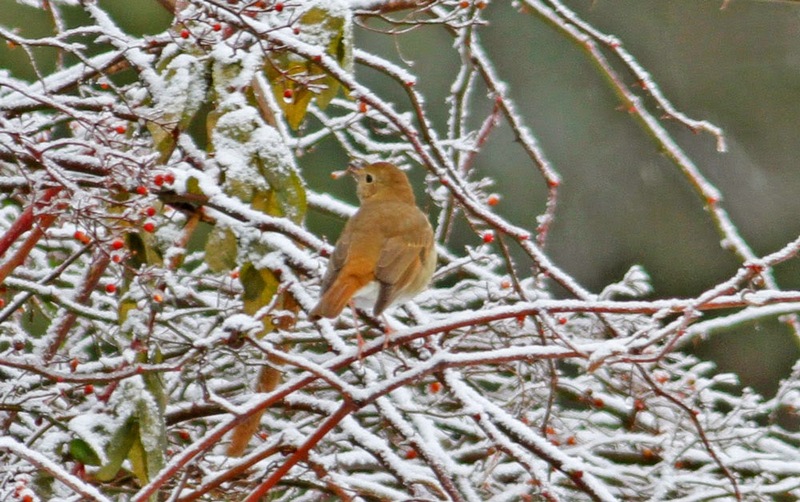 But, the day produced two fine birds, the first being a Hermit Thrush in our yard in Northfield right outside the kitchen window! Not an expected bird in December but not totally out of sight either. A short visit mid-afternoon visit to the Turner's Falls power canal produced a fine raft of about 60 Common Goldeneye and with them, a cracking male Barrow's. 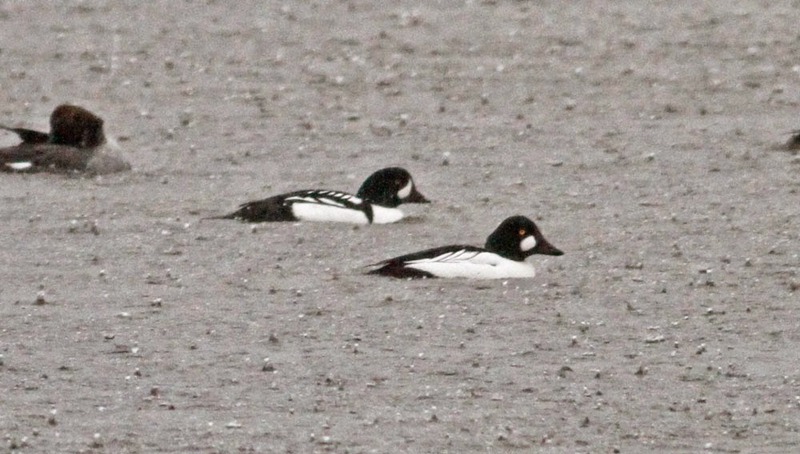 Although 1-2 Barrow's Goldeneyes can usually be found at the power canal each winter, they're almost always females and, as such. relatively easy to overlook. Males (in my experience) have been exceedingly scarce since I began regularly watching the area in 2005. In fact, this male is only the third that I've seen in the Pioneer Valley......all of them from the Turner's Falls/Barton Cove area and all of them in December. Barrow's Goldeneye - adult male with Common Goldeneyes, Turner's Falls power canal, Franklin Co., MA. December 9th, 2014.
white mantle spots, and obvious black spur (bisecting white flanks and chest).